Attended, Unattended, and Hybrid Automation: Which One for Which Process? There are few aspects of robotic process automation (RPA) that are more important for a business to understand than the differences between attended and unattended robots. Not only are these differences key to making sense of how RPA works, but having a sense of what they are and what they do is essential in order to choose the right solution for the right scenario. Both attended and unattended robots can automatically perform processes based on a set workflow and – with today’s more advanced solutions – their built-in artificial intelligence. But the two types of robots are activated differently, they communicate with humans differently, and they run on different computers. And while most RPA providers offer attended automation (performed by attended robots), unattended automation (performed by unattended robots), or both, Kryon stands out for its uniquely useful Hybrid Automation solution in which both kinds of robots work together. For decades, there has been a major gap between the robots we dream of and the ones we actually use. While many of us love watching the classic examples from science fiction and even comedic shows and movies, today’s businesses are turning to robots that are far more practical, productive, profitable, and – let’s be honest – humorless. So it’s understandable that some people would expect automation to make offices feel a little colder and more sterile. If you have read some of our previous blog posts on RPA and customer service, then you likely know what an asset automation can be for call centers. Instead of expecting your service representatives to focus on computer-based tasks while speaking with customers, you can let software robots guide these employees and lighten their workloads. This way, they can offer faster service, while also focusing more on creating a positive customer experience. But how can you most effectively identify the right tasks to automate for your call center? 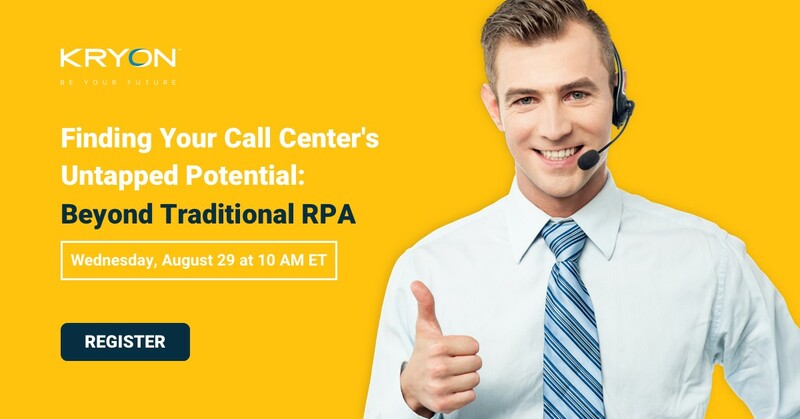 That is the focus of our upcoming live webinar, Beyond Traditional RPA: Finding Your Call Center’s Untapped Potential. We invite you to join us at 10:00 a.m. Eastern Time on Wednesday, August 29th, to discover how innovative technology can help you streamline your approach to choosing which processes to automate (and in what order). We are happy to announce that Kryon has been recognized as an RPA strong performer in the "The Forrester Wave™: Robotic Process Automation, Q2 2018", receiving the highest score possible in the “Innovation and Market Approach” and “Product Road Map and Differentiation” criteria. What do Mozart, Schnitzel, and RPA have in common? You can enjoy all three things if you join us on March 1st - 2nd for the RPA & AI conference in Vienna, hosted by the TBM Group. Robotic Process Automation (RPA) and AI technologies have given business leaders the opportunity to make faster, more accurate decisions, and discover new opportunities for growth. This event is the perfect place to learn how your organization can start leveraging these technologies to enrich your digital workforce. Kryon Systems and OpenConnect Systems announced today a partnership leveraging each company’s market strengths to bring a combined best-of-breed solution to enterprises seeking to integrate an enterprise-aware intelligent robotic process automation (RPA) solution. We are thrilled to announce the launch of our Hybrid RPA solution that will pave the way for enterprise digital transformation with the introduction of the collaborative human-robot workforce of the future. At Kryon Systems, we recognized that providing a true end-to-end solution required a team effort - between the robots and humans. We call our new approach “Hybrid RPA.” From cars to mobile apps, hybrid technologies offer organizations the means to gain increasing flexibility and scalability that is the hallmark of the hybrid concept. Kryon’s Hybrid RPA lends this same concept to your business processes.